No Downtime, Non-surgical Facelift. Get $1500 Off Thermage CPT Now in West Palm Beach! Featured on Dr. Oz – Dr. Doris Day explains how Thermage CPT is a great treatment for women in their 40s. First, the CPT technology breaks up the pulse into a series of micro pulses. Second, the CPT technology delivers the Thermage pulses with vibration. Vibration reduces the sensation of heating which leads to improved patient comfort. The greatly enhanced patient comfort allows us to make many more passes over the tissues. Depending on the area, we now make 8-12 passes with Thermage CPT instead of the 4-5 passes that we used to make. Also, the Thermage CPT treatment tips have been redesigned and now deliver much more uniform heating of the tissues. 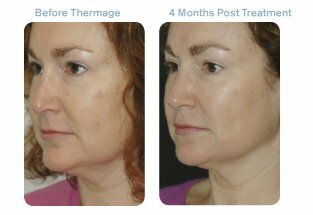 The more uniform heating of the tissues combined with the increase in the number of passes leads to Thermage CPT being a much more effective skin tightener than the earlier generations of Thermage. The Special is Now $1000 Off!